The Gandhara region, including the cities of Taxila (Takshashila) and Srinagar was the hub from where the awareness spread. The area had long been famous for its production of superior sculptures. Even Rome placed orders there. Iconography of the Lord therefore developed quickly. At first, he was pictured with a mustache, sometimes a beard, and most often with curly long hair, frequently tied in a bun. Every culture, understandably added their own cultural looks—the eyes in China, square jaw in Cambodia, slender in South India, bigger nose in Bactria, etc. Thanks to Mahayana Buddhism, within a short time, iconographic details for an “orthodox” Avalokiteshvara was specified. This was important because he appeared in many forms—as per his nature—and iconographic characteristics guaranteed identification across cultures and artistic media. Initially, only a few primary characteristics would identify an Avalokitesvara. Long wavy black hair, often tied in a bun, as opposed to straight Asian hair. S/He holds the Mani, or Jewel in two hands in front. The jewel of wisdom, of Om Mani Padme Hum. He could have as many as a thousand arms and heads. In his hands, he would hold, a book of teaching, a conch shell, a disc, prayer beads or a necklace (from a story in the Lotus Sutra), a lotus, and several optional items were added over the years. 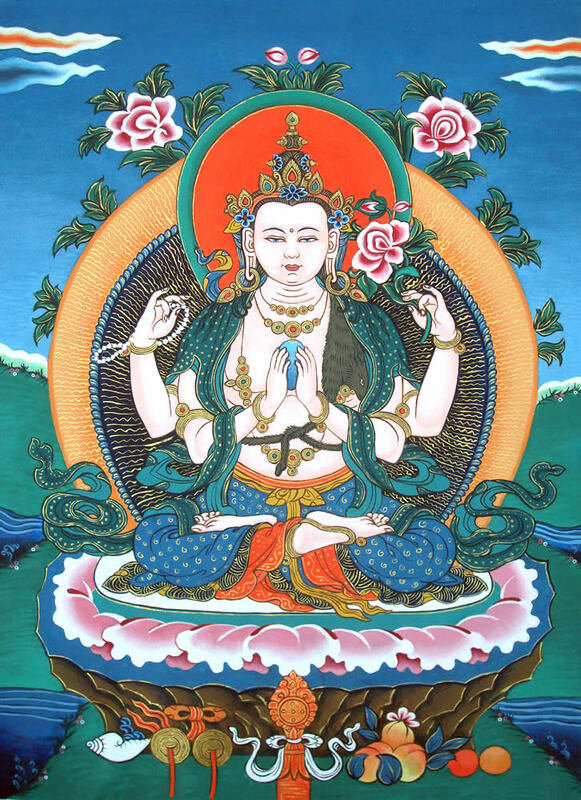 Bodhisattva Tara in her White (Yang) form or Green (Yin) form accompanied Avalokitesvara, but always smaller in stature. Tara sometimes looked like Avalokiteshvara, only overtly female. Sukhavati became associated with the lotus plant, so much so that in Buddhism, Amitābha’s family is referred to as the Lotus Family. From Amitābha down to Tara, in iconographic depictions, all are associated with lotuses—a different color for each. By the fifth century, another feature became customary, which prevails today—that of androgyny. Because of the Lord’s teaching that spiritual beings do not have gender, but can express Yin or Yang qualities as they wish, plus the Lotus Sutra saying the Lord appears in any form, also a woman—androgynous depictions of the Lord became popular. Some devotional art incorporated features of both genders. This was a good fit for Wayism’s teaching that women are equal and important—or that human body gender is unimportant. Devotional art of this style drove that point home. Exceptions to the ‘androgynous rule’ are often seen in Theravadin cultures, which are characteristically male-dominated. Cambodia, is an example of where Avalokiteshvara is not only male, but overtly so. 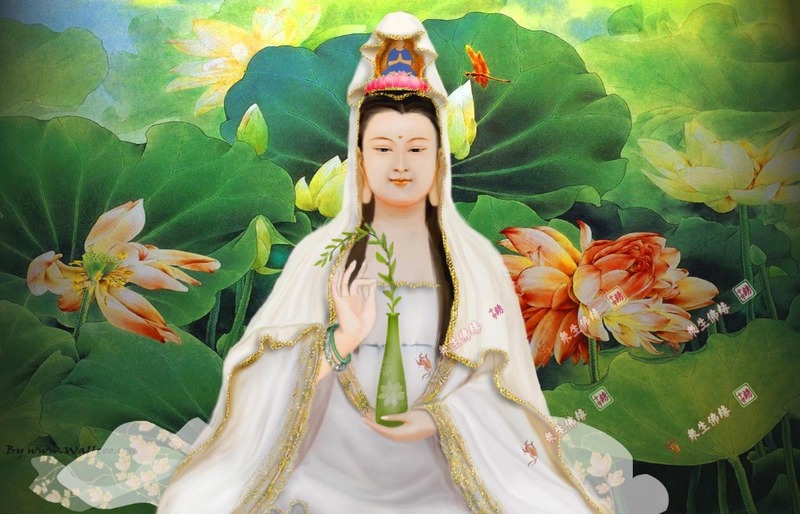 In China, the Lord’s Sanskrit name is translated as Quanyin, and there, she is wholly female, an older female. By the seventh century, erroneous thinking had already started. Documents surfaced that extolled Avalokiteshvara by His many usual titles—Savior of the World, Lord of the World, the Compassionate Buddha and the mother and father of Buddhas (because all new spiritual beings were born again because of the Lord)—but these added “Creator of the Universe.” Exactly that which made the Lord come down to Earth in the first place, started again. Some people—fortunately a small percentage—therefore raised their children in a belief system that again embroiders on the divinely simple tapestry, the basic yet beautiful simple Truth. It has been many years since the first of those “Scriptures” surfaced; fortunately, it is not yet a widespread belief. Now that the West embraces the Light, the spirit of reawakening will hopefully overcome the yearning for over-embroidering. The Lord appears to humans now, as we speak, in many forms. Eastern devotees of the Lord have developed and specified iconographic details of each of the thirty-three forms in which the Lord may appear to humans—as revealed to them in eastern Scripture. Each form has a Sanskrit title and fine details are important—look for meaning in every piece of clothing, hand mudras, jewelry, items held in each hand, God the Father in the crown, the background and foreground items and which other spiritual beings appear in the religious art—all of these have meaning. These pictorial devices serve to teach children and illiterate people, and as holy icons in devotional centers and temples. Different faith communities have their own designs, but for most, people stick to the thirty-three forms. Although beautiful and inspiring, again we see human nature embroidering. However, I grew up in a spiritual desert of a protestant community. Apart from some old woman’s Bible, she may have forgotten in a pew, nothing in those church buildings made of it a holy place—no vibe, no feel, no…nothing—you were better off taking a Sunday walk in the park. Over the years, I have worshiped, and I mean worshiped, in temples, churches, shrines, valleys, monasteries, hilltops, under trees, on the beach, in a vast variety of religions—but the most barren places I have ever visited were my childhood protestant churches. I prefer the beautiful devotional art—whether or not the Lord thinks it is much embroidering, I do not care, because it warms my soul and fuels my mystic connection with Him and His.